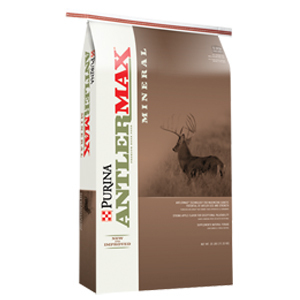 A highly researched loose mineral with proprietary AntlerMax Mineral Technology. This product is a power-packed nutritional package with ideal amounts and ratios of vitamins and minerals for superior antler density and strength, optimum reproductive performance and healthy calves and fawns. PROPRIETARY TRACE MINERALS- AntlerMax® Mineral Technology provides a power-packed nutritional package with proprietary levels and ratios of essential vitamins and minerals to help promote optimal antler growth, density and strength, reproductive performance and fawn health. RESEARCH FORMULATED - AntlerMax® Mineral Technology is backed by extensive research determining the requirements for superior antler and body growth. It provides ingredients of high biological availability and the proper balance of trace minerals. HIGH PALATABILITY - New and improved AntlerMax® Premium Deer Mineral is formulated with high-quality ingredients and proprietary flavoring agents to enhance palatability and ensure desired consumption. ANTLERMAX® DEER MINERAL FEED is a free choice year-round feed to deer as a supplement to help balance nutrient deficiencies that may occur in the habitat or pasture.